I think that for many beekeepers, learning about bee diseases is a bit like writing a will or completing a tax return. Something they know they ought to do, but which doesn’t appeal. Like most(?) others, I learned about the bacterial, viral and parasitic diseases of honey bees from text books and on a course. I knew it was important, but I didn’t find the topic particularly interesting. And actually I still find those sections of the books a bit dull. Anyway, when I thought I saw something questionable on a frame of brood in Queen Storm’s hive, I immediately went inside to consult the disease sections of all my books. Some of the larvae just hadn’t looked quite right somehow. But the book photographs looked different. I found myself swinging back and forth between being sure it was EFB and being sure it was nothing. So I rang an experienced beekeeper for advice. He came right over, and when we looked at the brood together, everything looked fine. He advised checking again in a week or so. And when I checked again in a couple of weeks, I couldn’t find what I thought I had seen before. The brood all looked healthy. So I put it out of my mind, and was glad that I hadn’t troubled DEFRA with a false alarm. But, as we now know, it wasn’t a false alarm. I posted earlier about the initial diagnosis of European Foulbrood (EFB) in the apiary and my searching for answers. Now I’m doing this short photographic series to show the chronology of what happened after the Bee Inspector found the disease. Now we’ve petrolled our bees, we are ready for anything! The Bee Inspector sees suspicious brood and tests it with a diagnostic kit including a lateral flow device. It’s a quick and easy field test sold by Vita (Europe) Limited. Then Queen Mab’s. Then Queen Titania’s. The Bee Inspector recommends destruction of the Storm and Titania colonies, but is prepared to ask the NBU to prescribe antibiotics for the Mab colony. The Inspector explains that samples will be sent to the NBU for confirmed diagnosis, and we will await the NBU’s directions for next steps. Meanwhile he talks me through what the procedure is likely to be. We will have 10 working days (= 2 weeks in the real world) to destroy the bees. There is paperwork. 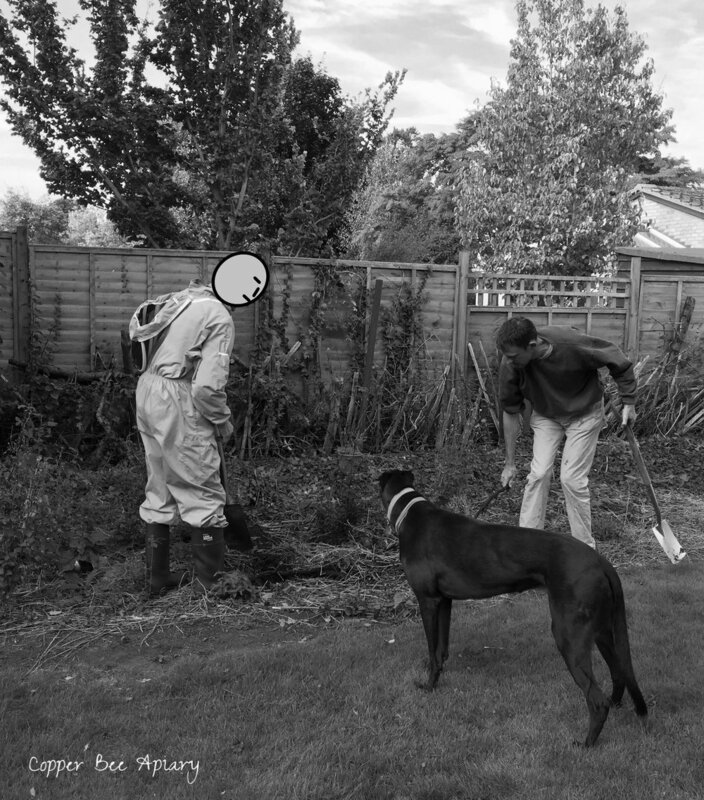 The Inspector issues a standstill notice on the apiary. 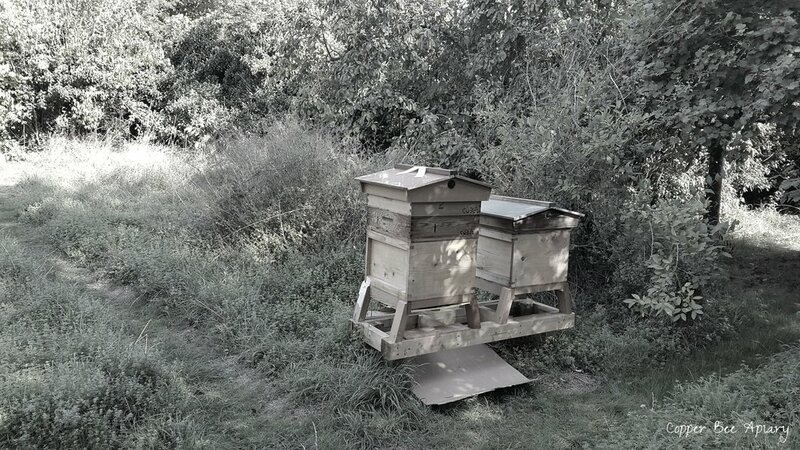 “No hives, bees, combs, bee-products, bee pests, hive debris, appliances or any other thing liable to spread the notifiable disease” may be removed from the apiary. This does not apply to items that were taken from the hives before the standstill order was in place. The Bee Inspector provides a licence for removal of supers from the affected hives so that honey can be extracted. There is little extractable honey but I do want to recover the wax from the the empty comb section racks. Comb honey is unusual - the Bee Inspector will have to relay my request to the National Bee Unit. The Bee Inspector follows up by e-mail to suggest a date of 10th September for the destruction, subject to the official confirmation from the NBU. This will require petrolling of the colonies on the evening of Sunday 9th. We agree the date. At the weekend, I do the licensed removal of the supers and section racks, adding ekes and clearers beneath the boxes that are to be removed. Gaps are taped against robbing. Taped X on the roof marks the condemned hives. This is Queen Storm’s. This is Queen Titania’s. Having removed the boxes, I wait for the NBU’s directions about whether I can keep the wax before returning the boxes to the hives. Official communication from the NBU comes via BeeBase. As expected, the NBU confirms the EFB diagnosis and approves the Bee Inspector’s recommended actions. The Bee Inspector also follows up with me to confirm that the NBU has agreed to wax taken from the 3 hives being extracted and melted, and to comb honey being taken for personal consumption. I spend the weekend taking apart the comb sections that I had previously spent a weekend putting together. And I extract some liquid honey from Queen Titania’s hive. Then the boxes containing the empty frames and sections go back on the hives. This is Queen Storm’s (left), with Queen Romaine’s next door. I insert the hive floor boards, with rags on to absorb petrol. I spread cardboard underneath. Later in the evening, after the last foragers have returned home, I tape the hives closed. A chilling photograph. Pouring petrol into the hive through the crownboard hole. 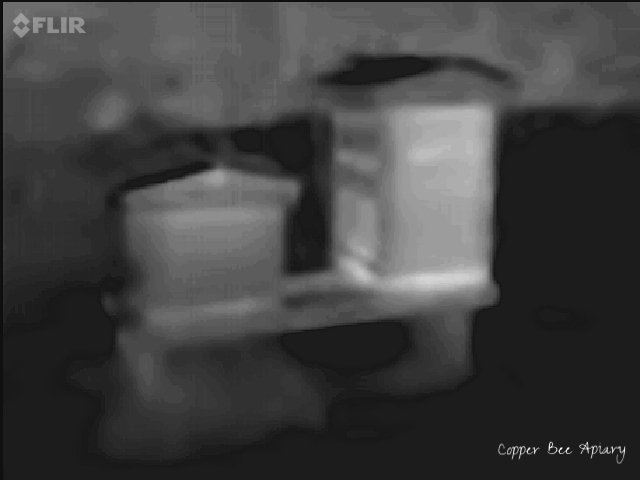 Thermal camera image. The bees roar but then quickly go quiet. 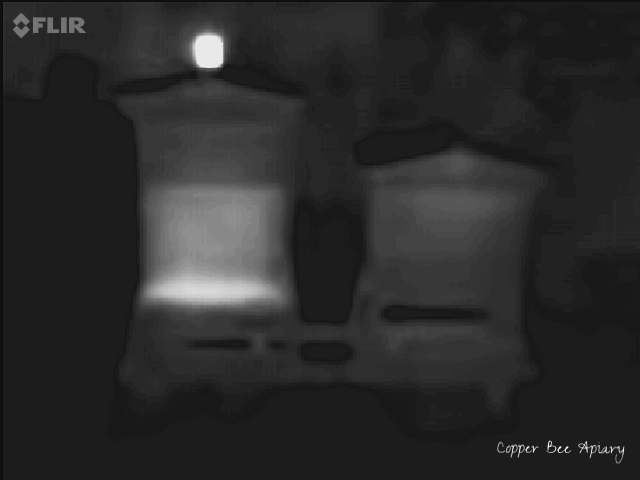 Thermal camera image shows their warmth in the hive. The heat of the bees is still visible as a layer over the hive floor an hour and a half later. The heat in Queen Storm’s hive (left) contrasts with the cool of Queen Romaine’s (right). I can’t hear the bees but I worry they are still conscious. It’s the same in Queen Titania’s hive (right) compared with Queen Mab’s (left). I rest a mug of boiling water on the roof of the Storm hive. I want to see which will cool faster, the water or the bees. I hope the bees will not remain aglow after the water has gone cold, because that would suggest they are still producing heat. But I can’t stay awake long enough. This final thermal image is taken nearly 4 hours after the (cold) petrol was poured in, and both the water and Queen Storm’s hive are still glowing. In the morning, the taped hives are quiet. The apiary smells of petrol. A single late-returning forager is clinging outside the taped doorway of Queen Titania’s hive. 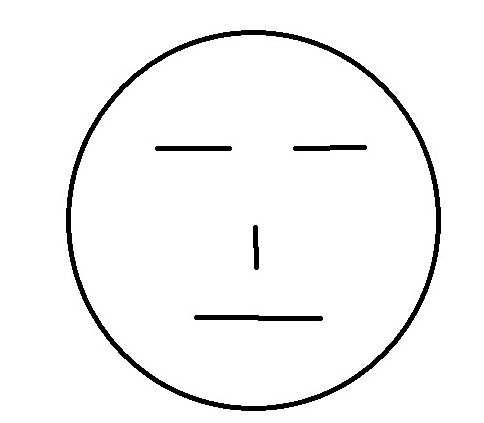 At 9 am, the Inspector arrives as planned. I think he’s half expecting that the colonies have not been despatched. It must happen sometimes. 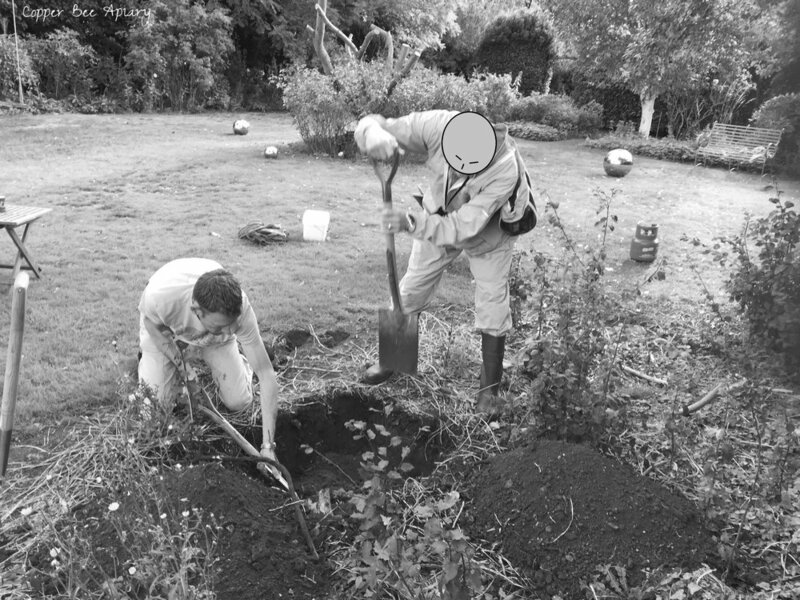 But since we do indeed have 2 dead colonies, we can get started digging the pit. I suggest a place in the apiary but the Bee Inspector thinks it will draw too much attention from the other bees, so we find a place in the garden, along the side where a row of conifers was recently removed. It doesn’t take long. He’s clearly a man who has dug a hole before. The pit measures 1 m x 1 m x 0.5 m.
…and many more are piled on the hive floor. Queen Titania’s hive looks the same. I cart the hives to the pit. And remove the frames from the brood boxes there. The layer of dead bees is deep. We throw the frames into the pit, on some cardboard to get the fire started. 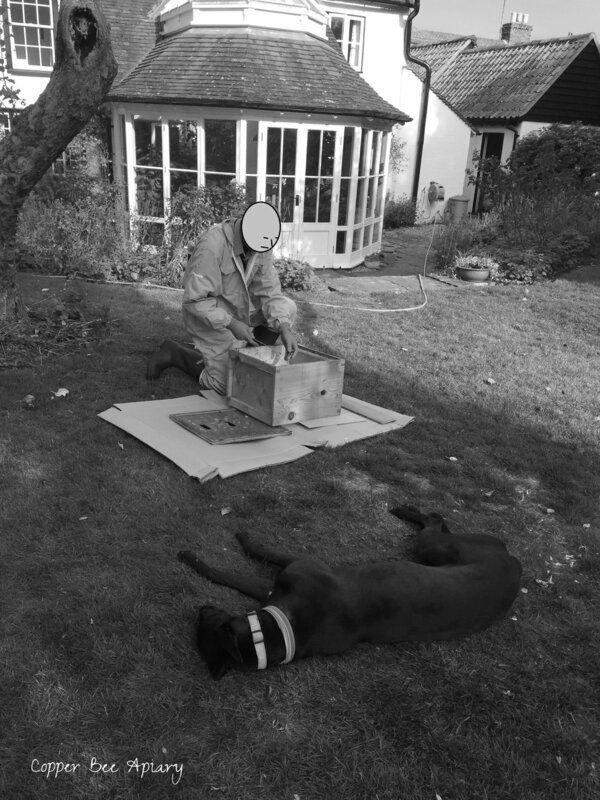 Meanwhile the Bee Inspector scrapes clean the hive boxes. Canine assistance is on hand at all times. As is the water hose you can see in the background, in case the fire got out of hand. Then the Bee Inspector torches the boxes with a flame gun to kill any remaining bacteria. He has to wear fireproof clothes for this. After dealing with the two destroyed colonies, it is time to administer the antibiotic treatment to Queen Mab’s colony. The Inspector selects a frame of largely empty cells, containing no brood. The antibiotic, oxytetracycline (OTC), is mixed with sugar syrup in a jar. The lid of the jar has holes punched in it. Syrup is shaken from the jar over the horizontal empty frame and gently patted into the cells. The lid has to come off to get the last bit out. The dosed frame is then inserted back into the brood box. Bees are already falling on it with enthusiasm. They eagerly drink the laced syrup. We close up the hive and leave the antibiotic to do its work. It’s all over by lunchtime. After the Bee Inspector has gone, I continue the clean-up operation, sterilising plastic things and portable beekeeping kit in bleach. Here it is left out to dry. Towards evening when the ground has cooled, I fill in the pit. This pot and a dish of my grandmother’s shells show the place. Update 17th October 2018: Here’s Part II.